New manufacturers, mindful of costs and the environment, open a fresh chapter in the state's long history of the industry. On so many riverbanks in so many Maine cities – Biddeford, Saco, Lewiston, Auburn, Brunswick – old brick mill buildings stand as testaments to the once thriving textile industry that fueled the local economy. Maine produced uniforms for Civil War soldiers and sent cotton all the way to China. Even as late as 1948, the mills employed 28,000 people. But those textile factories also employed farm girls for a pittance, polluted Maine waters, and required massive imports of raw materials. The environmental picture was never as pretty as the architecture. 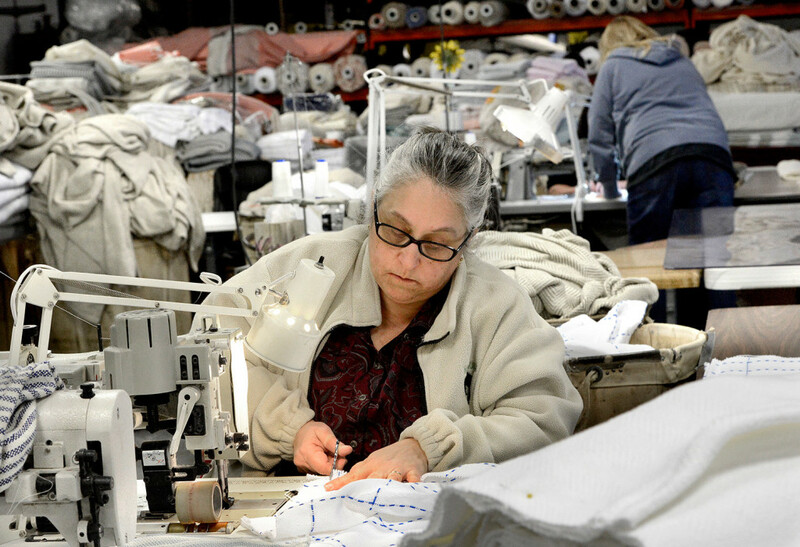 Now the state’s textile industry is enjoying what the Manufacturers Association of Maine is calling a “rebirth.” In a survey conducted jointly with Coastal Enterprises Inc., the Manufacturers Association of Maine calculated that 8 percent of Maine’s manufacturing jobs in 2013 were in the textile-related sector. The Maine Department of Labor, which is less inclusive in how it categorizes textile jobs, put that number at 3.6 percent, “a modest bounce-back,” as described by Glenn Mills, chief economist for the Center for Workforce Research at the Maine Department of Labor. 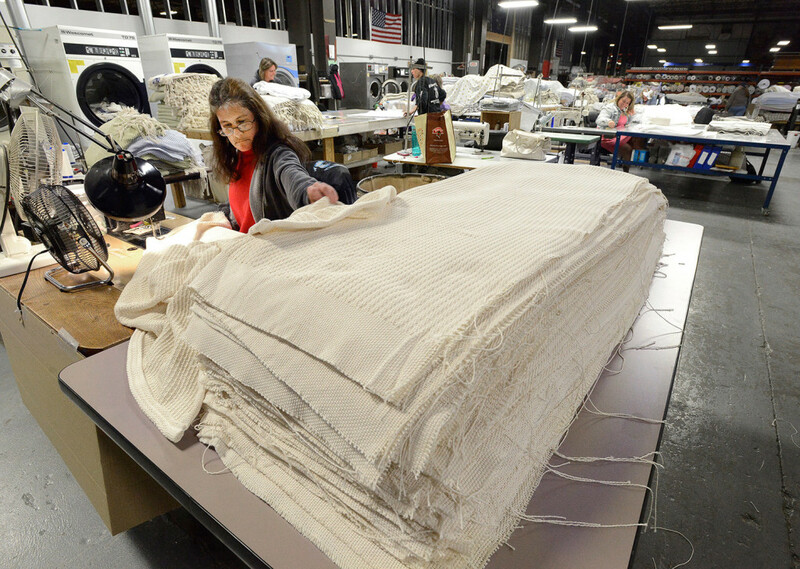 In 2013 there were 1,800 textile jobs in Maine. Mills expects 2014 data to show more growth, to about 1,900. Those are still small numbers compared to the era when entire towns grew around mills, but the trajectory is upward; of the firms that responded to the CEI/Manufacturers Association survey, 56 percent said they were planning expansions. That’s an apt analogy, because for many if not most of these companies, going green is a crucial part of how they do business. The industry’s infamously dirty past makes today’s entrepreneurs highly aware of how they do business. But when it comes to textiles, measures of success are more complicated than they are in say, the world of locavore agriculture. 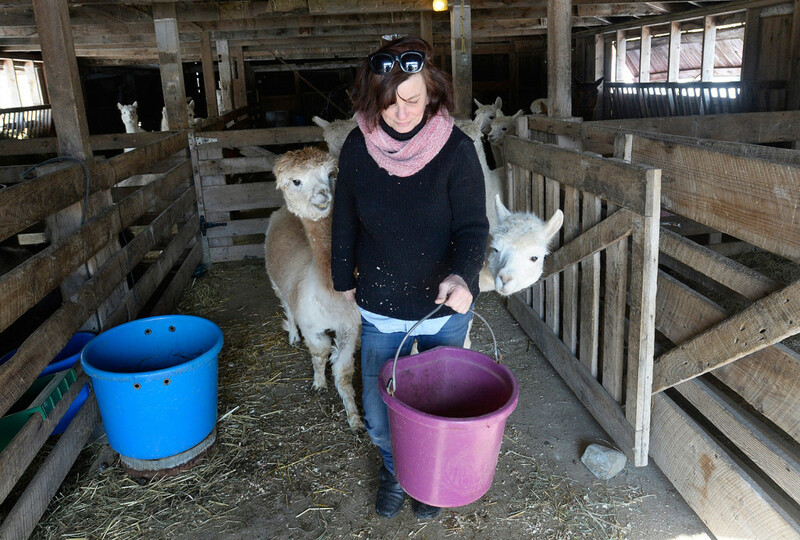 Unless manufacturers want to raise and shear alpacas or sheep themselves, as does Marcia MacDonald, who sells her natural, plant- and insect-dyed local wool under the name Lana Plantae, it’s hard to be completely green. Even if they do all that, they have to find customers willing to spend big bucks on that pristine, farm-to-sweater product they’re selling. So they make compromises and work with what’s available. They source all-natural materials from wherever they need to, but use vintage machines as David Kaufman of Brahms Mount does. They use different manufacturing models, as Jeremy Litchfield does with the athletic gear he makes from recycled materials at Atayne, to cut back on potential for waste. And increasingly, they are doing so not just with traditional fibers but also new fibers and making products that in many cases can’t be worn or used to dress a bed. 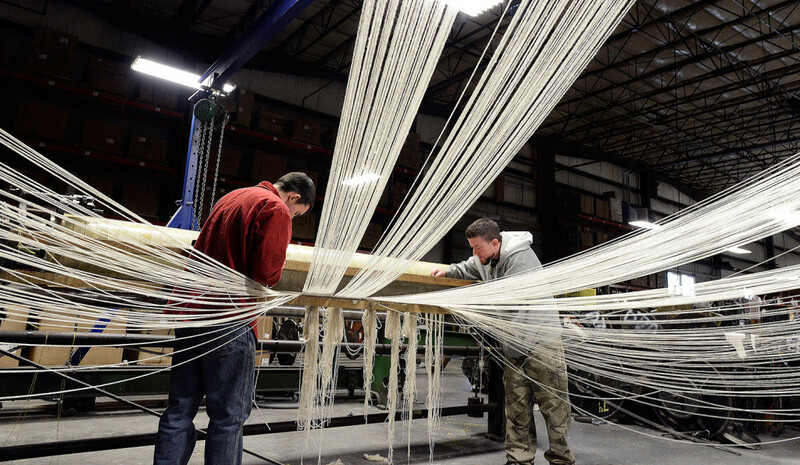 These might be composites used for hiking gear, like those made by Hyperlite in Biddeford; or nylon ropes for marine use, outdoor sports or fire and rescue, like those made by Sterling Rope in Biddeford. Or the advanced materials Elizabeth Whelan designs for clients like Nike and high-end chair manufacturers. One of the key players in the revival is the Saco River Dyehouse, which opened in 2012 in the former Westpoint-Stevens Mill in Biddeford. 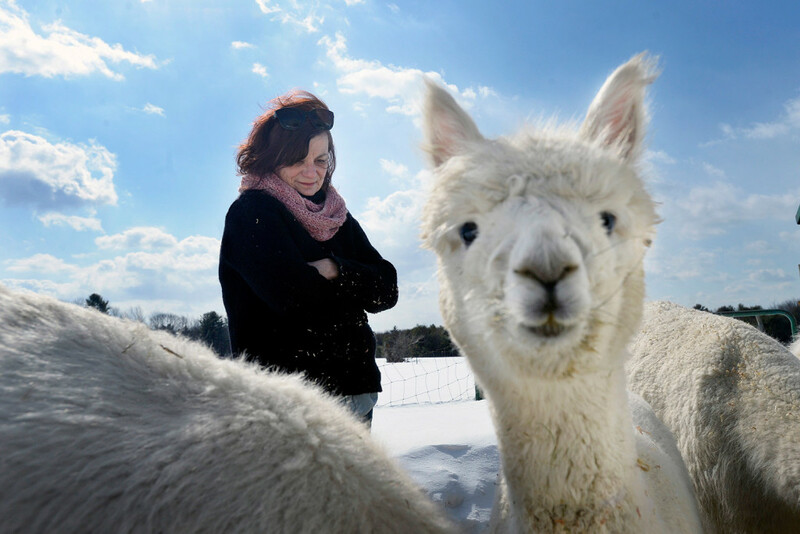 Claudia Raessler, its in-house counsel and driving force behind its inception, used to be a hobbyist who kept alpacas when she wasn’t practicing law. Then she started to dream big. Why couldn’t Maine’s textiles market come back? “Obsession is a good word,” she said, laughing. She and Quince & Co. founder Pam Allen bought old dyeing equipment from a Massachusetts company that was going out of business. 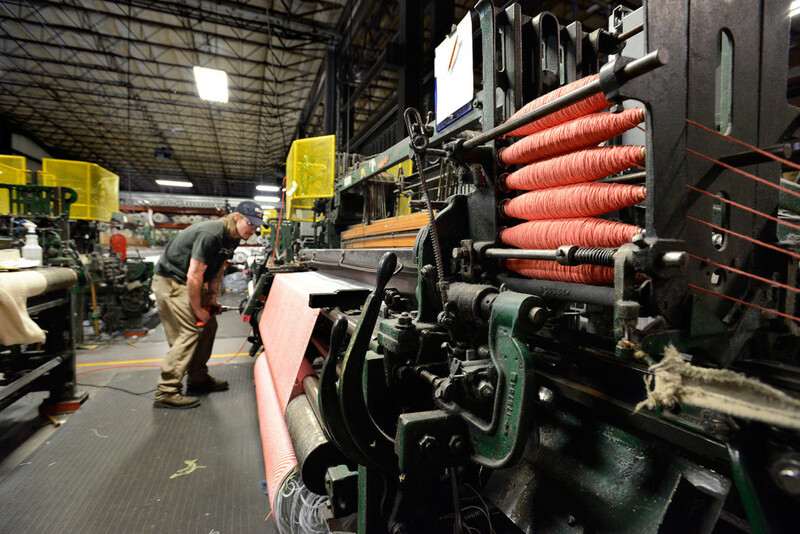 The Saco River Dyehouse now processes 96,000 pounds of textiles annually and is organically certified under the GOTS International Textile Standards. That’s great, but it’s not enough. Which is why Raessler has applied for a grant from the Maine Technology Institute to upgrade the dyehouse’s equipment. It’s not that she doesn’t value the rich history of that old equipment (once upon a time it was in a dyehouse in Harlem). “Everybody gets all misty-eyed,” she said, except her banker. But upgrades would allow her to cut energy and water costs by 40 percent, a better model for true sustainability. She’d also be able expand output, processing 300,000 additional pounds per year and working with technical textiles, as well. Some of these textile companies can trace their heritage directly to the old mills. Portland-based shirt designer and manfacturer Jill McGowan’s grandmother worked for decades in a woolen mill in Skowhegan, changing the cones for spinners. McGowan got her own start at the C. F. Hathaway Company of Waterville, founded in 1837 and shuttered in 2002. Since 1994, she has been designing and making shirts for women under her own label, running a “microfactory” in Portland to make her samples. “Those days are gone when there is going to be a mill with 900 employees,” McGowan said. 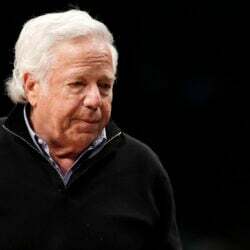 “Maybe in this new day it is all going to be businesses like mine, with maybe 20 employees.” Ninety percent of McGowan’s shirts are manufactured in Maine. But don’t try to get the name of her stitching company out of her; it’s like asking someone for their favorite baby sitter’s number, a secret too good to share. Raessler and others are advocating for increased training within the state for these industrial arts. 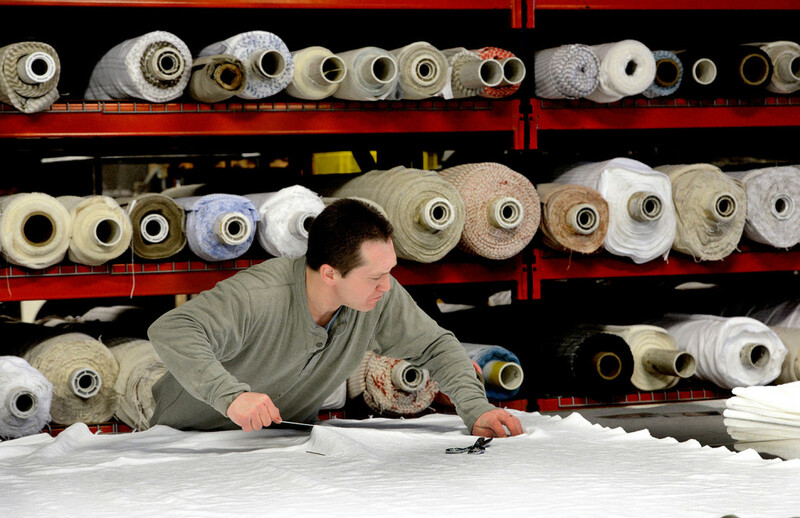 MECA offers the only formalized textile training available in Maine. Seventy percent of the companies CEI surveyed said they were concerned about finding a skilled and knowledgeable work force. That’s why Litchfield sends Atayne’s sewing to factories in Pennsylvania and Massachusetts. He’s about to open a new plant to dye and print his fabrics (all either 100 percent organic or 100 percent recycled) at the Brunswick Landing on the former Naval Air Base. His business is growing at a 30 to 50 percent rate per year, with sales of about 50,000 pieces annually. But he says a key component of his sustainability plan is to refuse to engage in the apparel market’s usual practice of mass manufacturing. Only 25 percent of all apparel is sold at full retail, he said, which leaves 75 percent to be discounted and/or shuffled around the world or even destroyed. Marcia MacDonald of Lana Plantae sounds almost apologetic when she explains that the insect dyes she uses are imported from Brazil or Peru. (She grows her own flowers, like marigolds and indigos, to do much of her batch dyeing.) Other than that, her biggest carbon footprint comes from driving to pick up the additional 500 pounds of wool she buys annually. 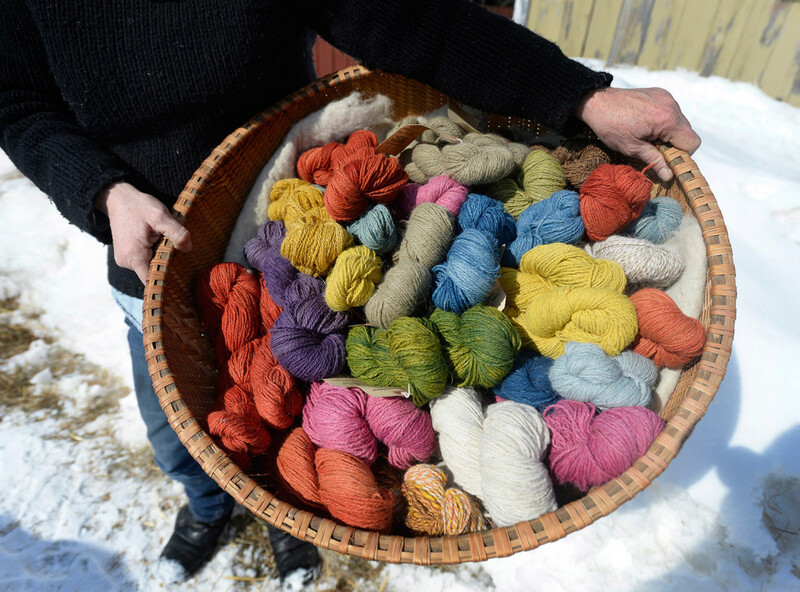 Her artisanal business will create some beautiful woolens, and so will Nancy Williams’s Newaim Farm in Waldoboro, which powers its tiny milling operation with solar power. But neither are built for growth. Since David Kaufman bought blanket and linen maker Brahms Mount in 2009, he’s taken the company into the 21st century at a rapid pace, turning the Brahms Mount brand into something so desirable that its products regularly make it into magazine layouts (Cosmopolitan last June, Parents magazine in December). A new partnership with Thos. Moser has Kaufman’s linens and blankets “dressing” the furniture maker’s seven showrooms around the country, two Maine brands making each other look good. But Kaufman doesn’t source his raw materials locally, nor can he. Not unless a lot of Mainers are suddenly willing to keep thousands and thousands of sheep. “We will source from wherever we need to [in order] to source what we need,” Kaufman said. 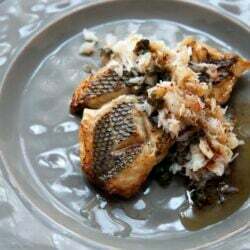 Quince & Co., which tripled its revenues between 2011 and 2014 according to operations manager Ryan Fitzgerald, takes the same approach, and contracts with some companies outside the state for production. Brook DeLorme makes a lingerie line called Brook There, designed in her Freeport workshop (which she shares with her husband, Daniel Pepice, who has his own clothing line for men, Seawall). It’s stitched in the greater Portland area. She uses organic cotton, not because it feels better on the skin (it does) but because she feels better about it. “Conventional cotton is the biggest pesticide use of all the crops in the world,” DeLorme said. American cotton sometimes travels to China to be milled. No one is going to grow cotton in Maine (it’s too cold) or mill it here, but DeLorme does the best she can, using domestically grown cotton milled in either South Carolina or California. That’s her contribution to sustainability and customers are, in turn, helping her sustain the business; 66 percent return to make a second purchase. Kaufman stays green by using antique shuttle looms from Biddeford mills that operate on one-horsepower engines and give his blankets their distinct look. When he expanded in 2012, doubling the number of looms, he found more “archaic” mill equipment in Rhode Island. “Really the same machinery that ran in the Industrial Revolution,” Kaufman said half-jokingly. 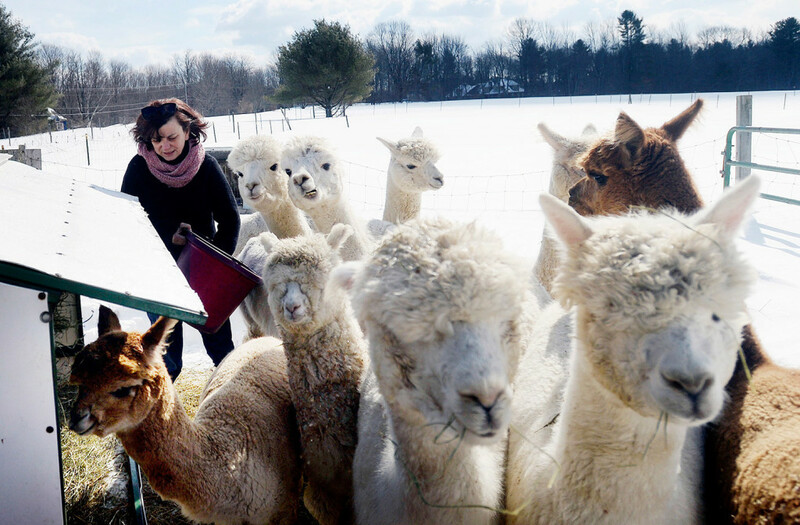 Raessler thinks a lot about her elevator speech, the quick pitch she makes to people to get them excited about the future of textiles in Maine. She knows the challenges, ranging from cultivating a work force and the dearth of local investors interested in textiles to negligible research and development being done in the state. Raessler can point to what she’s already done and what she wants to do, like obtaining that modern, energy-efficient equipment that would allow her to start dyeing nylon rope and other, technical fabrics. 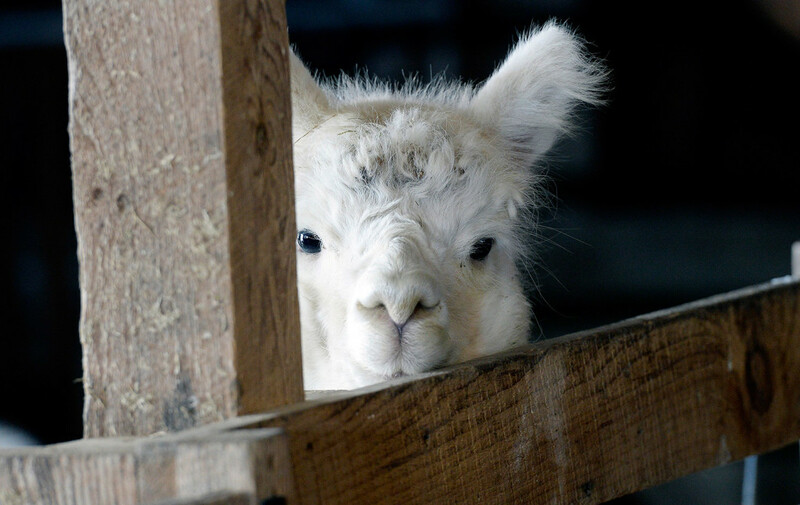 Not so warm and fuzzy as alpaca, literally, but filled with potential. He’s not going anywhere though; he loves Maine too much. So does Jeremy Litchfield, who didn’t return to his home state (he grew up in Durham and went to Bowdoin College) because it was a great place to gather discarded plastic bottles to recycle into athletic gear. “Our reason for being in Maine is more about the lifestyle and values,” Litchfield said. But can he promise he’ll keep Atayne in Maine? “In an ideal world, we’d stay in Maine and 100 years from now we’d be the next L.L. Bean,” Litchfield said. “But at the end of the day, we still have to do what is right for the company… if we are not getting what we need here, then we have to start making big decisions.” Which is what those old textile manufacturers did as well.